You want insights to make the most of a live event. 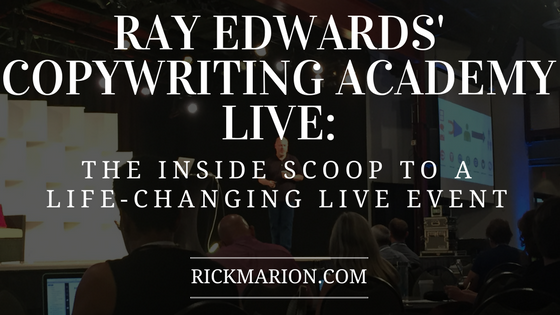 You want the 'inside scoop' on Ray Edwards’ live events. You want to host a life-changing live event for your own audience. Reverse-Disclaimer: This ‘review’ is not an attempt to sell tickets to an event. There are no tickets for sale. In case you’re not familiar with it, Copywriting Academy is Ray Edwards' high ticket/ high value training that teaches people ‘how to write copy that sells’ (also the title of his book). And if you’re not familiar with Ray Edwards, he is known by many as the best copywriting trainer around. 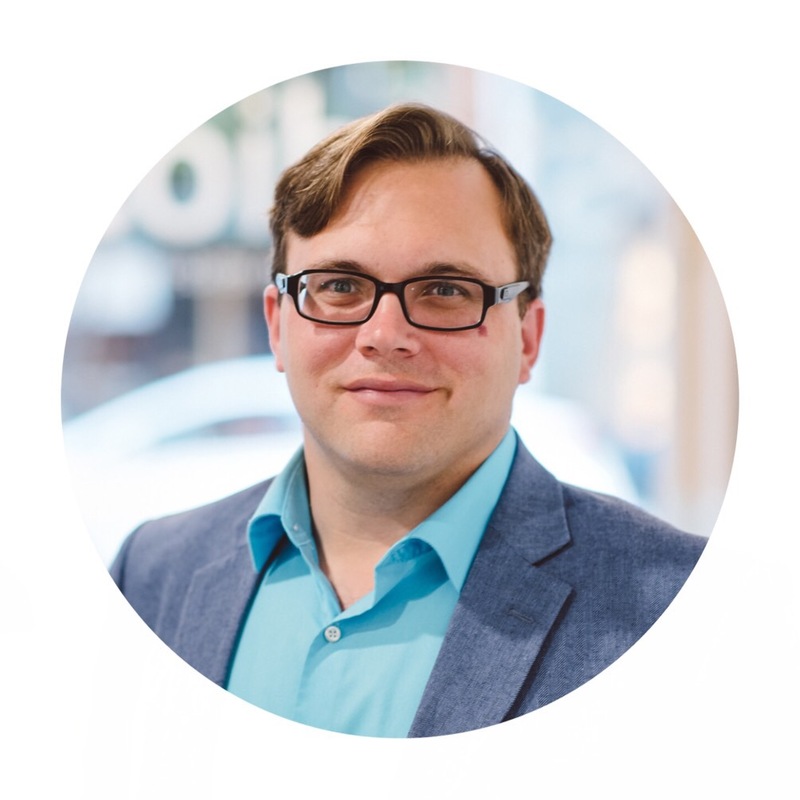 As a communications strategist and copywriter he’s worked with Tony Robbins, Jack Canfield, Mark Hansen, Jeff Walker, and Michael Hyatt. Ray's work has made millions of dollars based on his sales letters, the mentorship he provides, and the revenue from his own business. I read Ray’s book and it provided a pretty good understanding of his PASTOR framework (more on this framework in a minute). What more was there to know? Coming into the event, I had zero intention to learn anything about copywriting. My purpose for attending was to connect with friends, and maybe start some new relationships. Within just a couple hours into the live event, and after going through some of Ray’s clarifying writing exercises, I was conflicted. Everyone else was writing and getting guidance from Ray and his team. I was here to help, not to get help. Then it hit me (and it didn’t feel very good) – Realizing that I walked into this event with a subtle sense of “know it all-itis.” Highly contagious if you let your guard down. As I'm sure you know, anytime you put yourself on a pedestal... it’s time to brace for the fall back to humility. Soon after this realization, I came back to earth and settled in to learn, grow, and help if possible. In fact, the whole weekend (before, during, and after the event) had such a profound impact, I wanted to share it with you here and hope you get something from it. This was my first business and marketing type of event. Fortunately, there were some friends also attending and we scheduled a couple times to meet days before the event. A review and inside scoop of an event wouldn't be complete without "constructive" feedback. As my first business and marketing related event, I don't have much to compare it to. So you may be disappointed in my constructive criticism, if you're a naysayer, because I honestly don't have any. For those who have attended other events, I'm sure there are things that Ray and his team can improve on or add to enhance the whole experience- no one's perfect. But from my perspective, it was truly a remarkable experience. One thing that stands out with any great trainer, teacher, or coach is the ability to ask clarifying questions that gets to the core of a problem. In the workbook provided by the event, there are writing exercises that get to the core of your business and message. For example, they provided a template to get your "Empowering Core Thesis Statement": Any [freelance copywriter] can [make a six-figure part-time income] by [using] the [value-based fee model]. The writing exercises continued all throughout the event and the weekend. But they didn’t just consist of writing. We provided feedback amongst ourselves, and got input from the copywriting coaches and from Ray himself as some would share their copy out loud. The live feedback from Ray was invaluable – even if it wasn’t for your copy. A lot of insight can be gained from seeing someone’s copy get critiqued, massaged, and clarified live, especially from someone with Ray’s experience. If you followed along with the exercises, then by the end of the event you would have a usable, critiqued sales page. This sales page is marketing material that some businesses will pay a copywriter over $100,000 to write! But Are Templates The Way To Go? I used to be an anti-templite. I didn’t like templates because they assume a ‘one size fits all’ approach. And there’s one sure thing that will kill your ability to stand out in any marketplace – being the same as everyone else. If you're not careful, using templates will make you blend in with everyone else. I was very happy to hear Ray drive this point home. So much that in each of his templates, he specifically says not to copy it exact. They are guidelines. Starting points. Time and time again throughout the event Ray made this very clear. And when you witness going from a template to an original piece of copy it’s that much easier to understand and replicate. 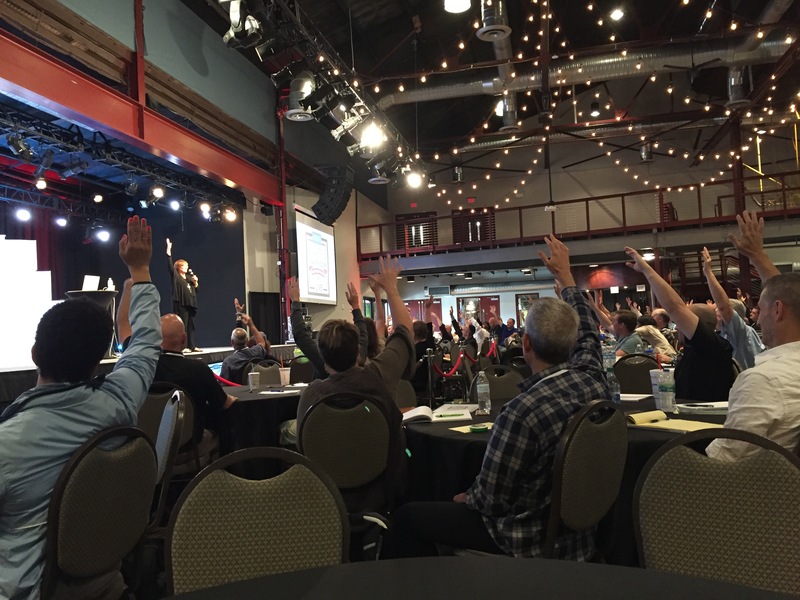 Overall the writing exercises were one of the most valuable aspects of the event – you had dedicated time and support to create usable sales copy, and the live feedback and critiques gave even more insight to the process for future use. These coaches were the hidden gems inside the event. The coaching session time-slots were in 15 minute increments... and I thought "What can you accomplish in 15 minutes?!?!?" And… I was greatly mistaken. The coaching sessions were some of the most valuable 15 minutes I’ve ever experienced. As I stated above, asking the right questions combined with having the right experiences and insights makes an effective coach, trainer, or teacher. Especially in an atmosphere that’s supports learning and growing. I’ve known Jody for over a year but we met in-person for the first time just a few days prior to our coaching session. I’ve talked to Jody pretty regularly over the last year, give or take, about topics such as business, podcasting, and marketing – so what’s a 15 minute coaching session going to do? Well, Jody helped reveal the missing puzzle piece in my life and business by asking great questions and listening with a curiously strategic ear. As we worked together in this short time, I knew something big was happening. I’d heard great things about Andy, mostly that he’s had a hand in lot of entrepreneur’s success. 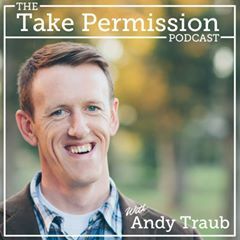 I had no idea what I was going to ask Andy, or how he might help. After a couple minutes it was clear that he’s a very strategic thinker. Oddly enough, the conversation quickly went from strategy to relationships. After our session, I walked away with a completely new outlook on building and cultivating relationships. Always striving to, ‘be of service and provide value’ as my first business mentor told me, this wasn't exactly a new concept. But for some reason, after the coaching session with Andy, this principle seemed to click at a much deeper level. It had nothing to do business. It had everything to do with thinking about others. It’s hard to explain – one of those ‘aha’ or light-bulb moments I suppose. I literally walked away completely thrown off my tracks – in a good way. Growth. In just 15 minutes. Marshall was my first coaching session, so maybe I was still on my pedestal, or at least on the way down back to humility. When Marshall told me how he stands out from other copywriters, what he offers that most other writers don’t, it was clear… that I wasn’t as clear as I wanted to be. When he told me about his copywriting services I immediately thought, “I want to hire you.” That’s powerful. Jack connected the dots between copywriting, marketing, and personal development with an idea for a digital product. It's crazy how in just a few minutes a good coach can see your blind spots. Oddly enough, Jack and I have some other things in common and the conversation turned more personal than business. You never know what to expect when you meet someone new, and as a coach at Ray's event, you can bet they have a lot to offer - both personally and professionally. 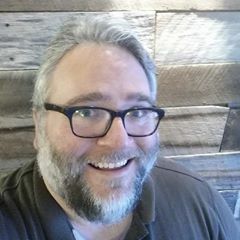 Jack has his own copywriting, consulting, and coaching practice, and after he connected the dots for me it was clear why Ray and his team selected him as a coach. You can find out more about Jack at jackainley﻿﻿.com. 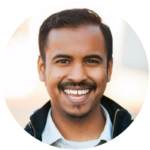 After asking a generic but revealing question about the most common challenges with funnels, not surprisingly, Neal went in-depth about pricing and market awareness. These are two very important components to evergreen sales that can make or brake an offer. Sometimes it’s the simple questions, the obvious ones, that slip by unless there’s some kind of intervention. Brian, and his wife Juliana, helped intervene and provided a new focus mid-way through the event. If you can’t already tell, I was blown away by how much I got out of these 15 minute coaching sessions. In a total of 105 minutes (7 sessions), the breakthroughs and insights gained could have easily cost over $1k in coaching fees. An added benefit is the varying perspectives between the 6 different coaches. 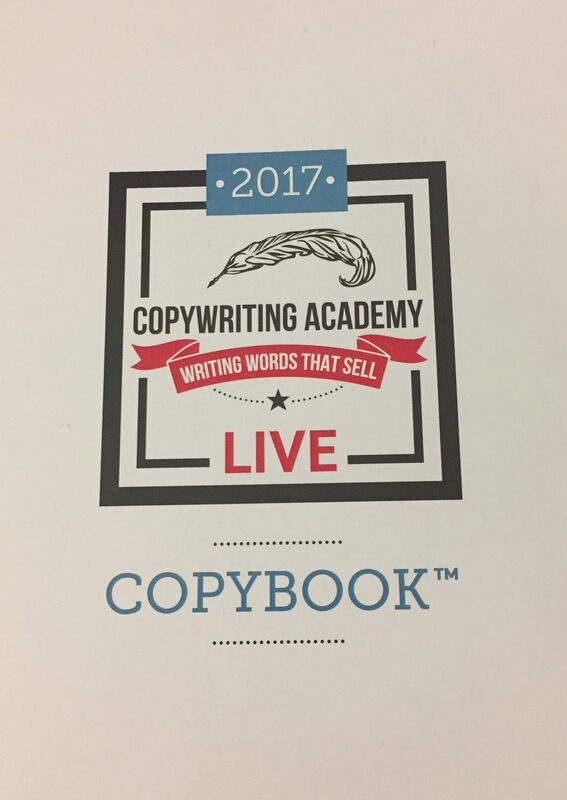 As stated before, the coaching alone was well worth the price of Copywriting Academy and the live event. 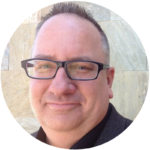 Mike’s a marketing consultant, branding expert, communications strategist, and copywriter. Mike owned the stage immediately. 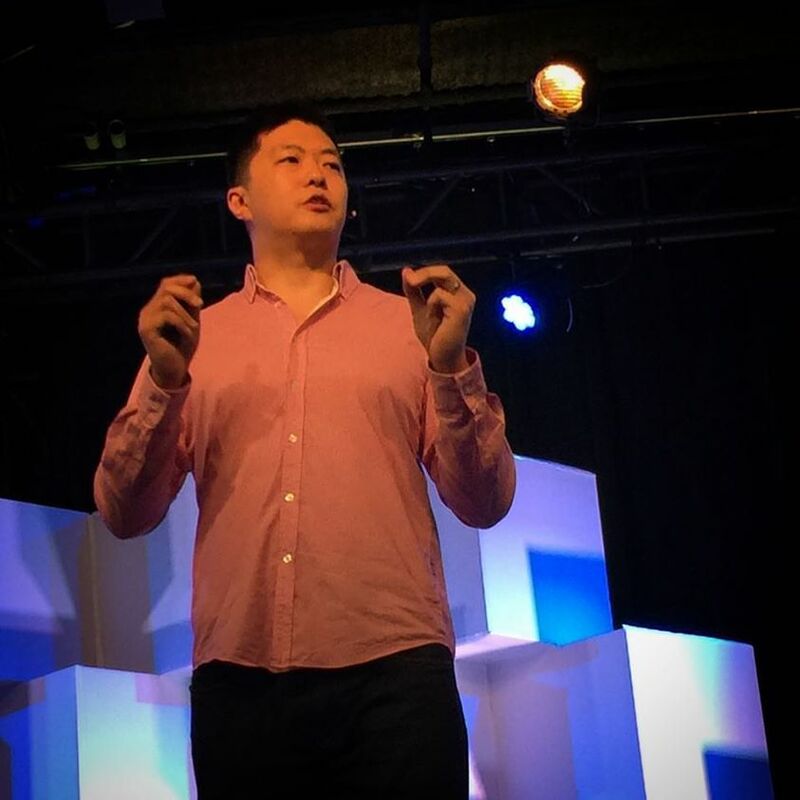 If you want to see a speaker take the stage, capture the audience, and keep them engaged for an hour, then get to an event where Mike is speaking (or hire him for your event) – between the valuable content he delivers and what you can learn about stage presence, it’s definitely worth it. The first step of Mike’s framework is your personal story. Mike’s approach is a simple yet effective strategy to narrow down your story. It was a hit – I can’t tell you how many times I heard people say they’ve never thought of their story in this way. Mike also uses a unique clarifying technique to help people when they’re stuck at the ‘what should I offer’ and ‘who is my avatar’ stage of their business and branding. He suggests asking two simple questions, but don’t underestimate them – I heard people go back to these questions all weekend and rave about how simple it made this process. Both of these questions pierce through all the marketing fluff and get right down to it. Mike continued to go through the remaining steps to show how they all work together, and where copywriting fits in. 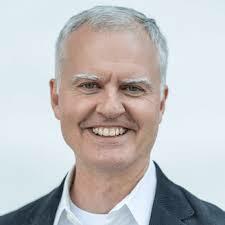 Ernie Svenson was a practicing attorney who stumbled into the blogging world years ago. He now helps other attorneys leverage technology to boost profits, cut overhead, and outmatch big firm lawyers. Ernie’s drive for efficiency really hit me when he said something to the effect of, “wasting time clicking the same buttons over and over again, clicking this menu, then dragging down to select the next option, and then you move the cursor too far and you have to click the menu all over again etc.” I’ve done that, many times. I realized this guy is serious about productivity, and that I need to take it more seriously. Ernie recommended a number of simple tech solutions to make life and work easier, quicker, and more efficient. To be more productive and automate business, you have to grasp the concept of taking a couple minutes now to set something up, and as a result save hours upon hours in the future. Evernote is much more powerful than I thought. Ernie gave a couple examples, including emergencies, when important personal documents were stored in Evernote, and within minutes he saved the day by emailing the document. Examples of things to store are vital documents, receipts, software license codes, and business/copywriting swipes. One brilliant suggestion he gave was to store competitor sales pitches and elevator pitches, as well as your own so you continue to evolve and improve it. The back and forth emails to schedule an appointment is such a hassle. It can easily take half a dozen emails to agree on a time and date. Scheduling apps are great because you can set your availability, send the link to someone, and they pick a time based on your availability. Done. Ernie recommended ScheduleOnce http://bit.ly/ScheduleOnce and also mentioned Calendly https://calendly.com/. Ernie provided a quick example of how to use Text Expander and it’s pretty cool. If there is something you type over and over again, like your email address, physical address, or requests to speak, you can type just a couple letters and have the text expander application fill out the rest. Ernie gave many more suggestions, and went into much more detail about how these tools can help any business owner be more productive. What I liked most about Ernie’s presentation was getting a glimpse into how someone who works at a such a high level of productivity thinks about their work and time. Gail is the president of Mercer-Mackay. They help tech companies tell their stories through various forms of content to rise above the noise. Gail gave a powerful presentation prior to calling Ray to the stage. And it was quite appropriate because Ray has made a significant impact in Gail’s life and business. I won’t go into her story because I can’t do it justice (she’s a great speaker). But I will tell you the one message that I heard loud and clear, so much that it’s in the top 3 takeaways from the weekend. When you’re looking for work and in the growing stages of your business, always say yes. This may sound weird at first, but she made a great point – most of us are more resourceful than we give ourselves credit for. We will figure it out. Now, I will add that you have to use common sense with this. You may not be able to perform a miracle overnight, but to take on a new project with a quick turnaround that could transform your business, say yes! Gail talked about impostor syndrome (feeling like you’re a fake and have nothing to offer) as something she battled with. And knowing about her level of success now, for many it was comforting to hear this. She also talked about how to use templates and how not to use templates in copywriting. When she finally took Ray’s advice on using templates, instead of the way most people use them, her business exploded! Gail’s presentation was short but powerful. No matter your beliefs, journaling (or writing down your thoughts for those anti-journalers) can reveal powerful insights. This was quite the surprise! The guitarist that travels with Carry Underwood? Wow! I was expecting a couple songs to liven up the event. You know, mix it up some. As a creative artist Chad made it clear that being consistent and conscious with how he showed up would later open the doors for once-in-a-lifetime opportunities. Throughout his story and experiences, world famous artists and their managers contact Chad, request him for their tours or projects, and they don’t even need to hear him audition or provide a sample. Now that’s how you brand yourself! He ended his talk appropriately by performing a song – what an unexpected treat from a genuine, down to earth rock star – literally. Another suggestion Ray gave was to implement something, at least one thing, from the event while you are still attending the event. Taking that advice, I skipped out on a couple sessions to take advantage of some other opportunities. Because of this I missed a couple presenters and speakers. Based on the others, I have no doubt they rocked it just as well. There was a common theme throughout the event that’s missing in the business and marketing environment – spirituality and service. Ray doesn’t hold back about his spiritual beliefs, so it’s no surprise that he would mention God in his event. And no matter what your spiritual beliefs are, unless they’re straight up evil, it didn’t matter because the focus was more on ethics, morals, and service. In an environment with trickery, sleaziness, and desperation, the marketing industry needs to keep these principles up front. As Ray pointed out, how many "webinar training” have you been on when a secretive pitch was made at the end? Ray advocates being completely up front with your intentions – at least that’s how I interpreted it. If you provide an opportunity for more training via payment then don’t try to weasel it in. Just state it upfront. I was really impressed with Ray’s team in their commitment to serve the attendees during the event. 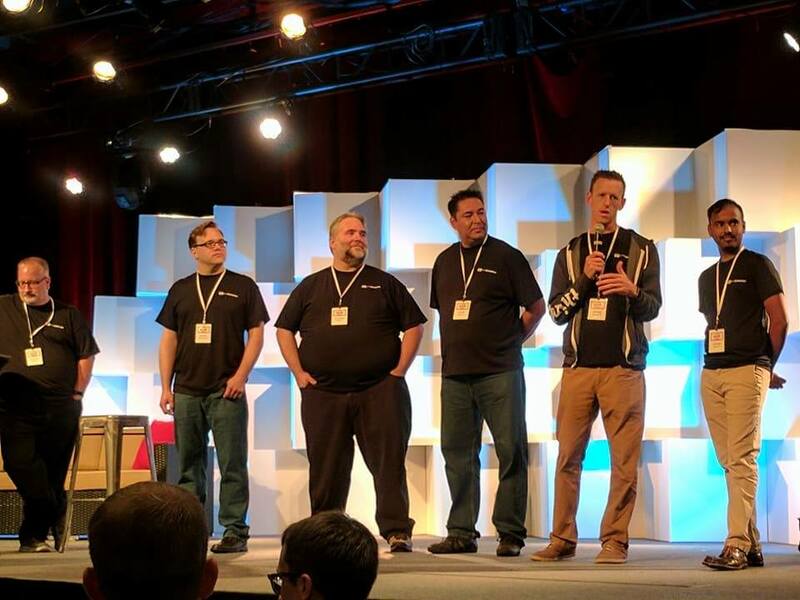 Their team had daily questionnaires online to get immediate feedback from the audience, and they actually listened and added training in the next day. This proved to me, without a doubt, that the Edwards’ team truly cared about creating the most valuable experience for the attendees. Between keeping their finger on the pulse, and holding live Q&As with Ray, this wasn’t a “listen to me speak for 3 days” kind of event. It was intimate. It was personal. And it felt like you could be real and raw with your business and personal challenges. On Sunday I noticed Ray talking with attendees, one after the other, for what seemed like hours. It was draining just observing it from afar. At first I thought they cornered him and he was just being a good sport. Come to find out Ray wanted to speak with every attendee at the event. One of the questions from an attendee during one of the the Q&A sessions was about Masterminds. Ray’s advise, which I believe he quoted from someone else, was to be in 3 types of mastermind groups: Peers, Paid, and Get Paid. Peers – A small group of people who are in a similar stage of business as yourself. Paid – Pay to be in a group with people whose business and influence are at a higher level than your own. Get Paid – Have people pay you to help them grow. When asked how to find these groups, Ray’s answer was similar to how you find most services – ask your network, list, and friends for recommendations. I can personally attest to the power of mastermind groups. I been in a few over the last year or so, and I attribute an estimated 70% of my growth to those groups. Between ideas, accountability, expertise, relationships, and even personal challenges, they are game changers. I still have at least a page of notes that I could continue to write about. There were nuggets of quotes, insights, and feedback that continued throughout the event. 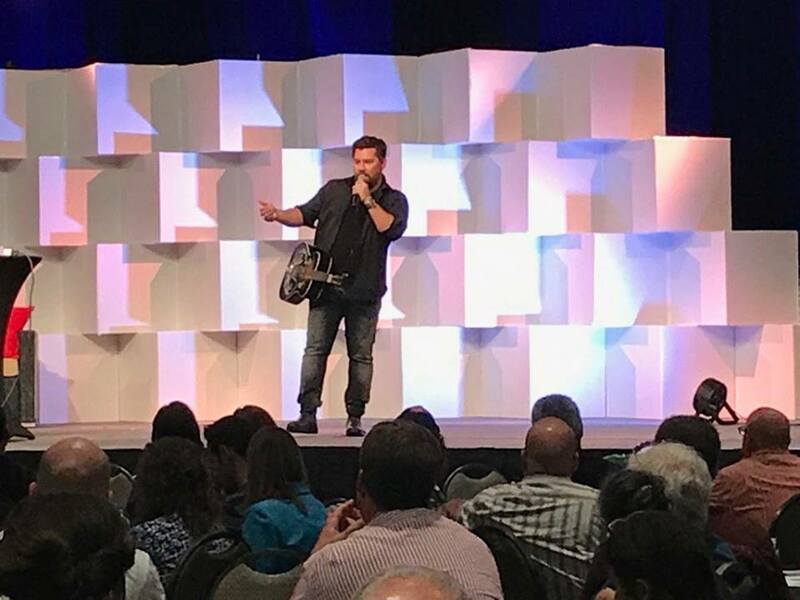 But for the sake of keeping this short(er), hopefully this gives you some insight to make the most of a live event, to get the inside scoop on Ray Edwards’ live events, or to put on a life-changing live event for your own audience. Everything comes full circle back to this quote. It’s about service, both for your customers, your event’s attendees, and beyond. Not only did the Edwards’ team teach this during the event, they showed by their example – all weekend long. 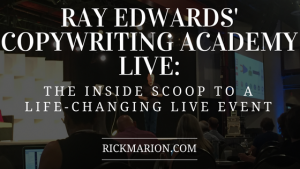 There's no doubt that Ray’s live event planted the seeds for new perspectives, new relationships, and stronger copywriting and marketing abilities. Many thanks for the hard work and dedication from all those involved! Disclaimer: Some of the links presented are taken right from their respected websites. They may receive affiliate compensations through these links.